Finally! A productive week in the garden! In spite of the oppressive heat this week, I spent most of it in the garden doing much-needed weeding and pruning, trying to get everything back into some semblance of order. As I've documented in several posts in recent weeks, for one reason or another, things had really gotten out of hand here and I was beginning to get quite desperate about it. But after spending several days ferociously uprooting the weeds that had threatened to overwhelm me and pruning back all those limbs that were headed where they didn't need to go (Well, some of them anyway.) I feel renewed and rejuvenated! I think there may be hope for my garden. In spite of my neglect, the garden is actually doing quite well. So far, there has been enough rain this summer to keep things going, with very little resorting to the sprinklers and hoses. In fact we received another nice shower just this afternoon. A raindrop from this afternoon's shower trembles on the tip of an almond verbena blossom. The 'Ellen Bosanquet' crinums continue to bloom profusely. And in another part of the garden the angel's trumpets are playing their sweet music. Moreover, the critters of the garden are flourishing. Everywhere I worked this week, I kept encountering tiny, newly-hatched green anoles, a well as many adults. The Mediterranean geckos still patrol the ceilings of the porches at night, looking for insects drawn to the lights, and once the sun goes down each day, the frogs begin their chorus. It is a truly amazing sound to step into the backyard at night and hear those hundreds, maybe thousands, of frogs around the neighborhood singing their songs. Butterfly numbers and diversity are back almost to where they were before we endured the long, long drought of last year and the year before. I see caterpillars of many kinds as I make my rounds of the garden each day. In addition to the butterflies, I often encounter interesting moths around the garden. I'm not nearly as knowledgeable about moths as I would like to be and so I often cannot identify what I see, but sometimes a picture will help. As I stepped onto the back porch/patio after working in the garden yesterday afternoon, I happened to look up at the light fixture and this was what I saw - a huge moth. It was about three inches long and if its wings had been opened, I estimated that its wingspread would have been at least four inches. I grabbed my camera and took a series of pictures. Here's the critter from a slightly different angle. With his wings folded, he was very cryptically colored and blended into the background. If I hadn't just happened to look up, I would never have noticed him. I checked my pictures against my field guide later and I think this is the Waved Sphinx Moth (Ceratomia undulosa). There are lots of sphinx moths around, of many varieties, and it is often hard for an inexpert observer like myself to correctly identify them. If you know this guy and believe my identification is incorrect, please let me know. And so, I end this week, for the first time in awhile, satisfied with my efforts in the garden. It is a good feeling. 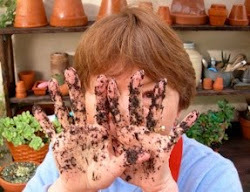 A few more weeks like this and I may not have to hang my head in shame every time I see my fellow gardeners! The 'Purple Ballerina' Datura has started blooming. I ordered the datura early in the year. I ordered the one with the plain white blooms. Shipment was delayed and delayed and the nursery finally informed me that their crop had failed and asked if they could substitute this purple-blossomed plant. Obviously, I said "yes" because here it is blooming for me! Datura is a very interesting plant. It is related to brugmansia, or angel's trumpet. 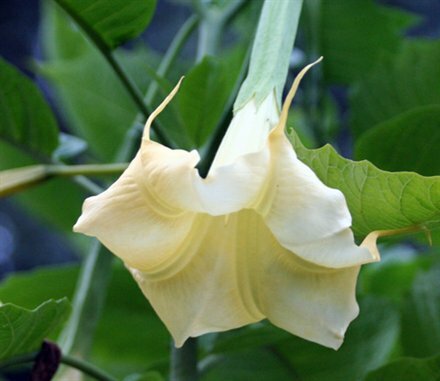 You can see the relationship in the shape of the bloom, but where angel's trumpets point their blooms (trumpets) down toward the earth, the datura bloom is pointed up toward the heavens. Thus, one common name for the plant is "devil's trumpet." Another trumpet-shaped bloom is that of the crossvine. 'Tangerine Dream' is a prodigious bloomer in early spring, but often it will put on second and third flushes of bloom for me in summer and fall. That is what is happening here. It's not only the plants that are blooming! The Eastern Bluebird pair that nested in my backyard earlier this spring and raised four babies have built a second nest and Mama has already laid these three beautiful blue eggs. I can only hope that their second attempts at raising a family will be as successful as the first. One can't have too many bluebirds! Bloom Day? What Bloom Day? I missed Bloom Day this month because I was on the road, so I thought I would do a make-up Bloom Day this Saturday and show you some of the things that are currently blooming in my weed-clogged garden. The duranta along the back fence is just beginning to bloom. You can see that there are actually more buds than blooms here. Later the blooms will be replaced by the golden berries which give the plant one of its common names, "golden dewdrop." In the same bed at the back of the yard is the tall-growing and very invasive 'Chi Chi' ruellia. When it gives me lots of these pretty pink flowers, I can almost forgive it its sins. A more well-mannered ruellia, low-growing 'Katie,' grows in another part of the yard. Did you ever make flowers from crepe paper when you were a kid? I can remember spending many long summer hours making those flowers with my mother. We used them to decorate the graves of relatives on "Decoration Day." I always thought that the paper we used was named after the crape myrtle. It was certainly crinkly like the crape's blossoms. The Texas sage which blooms in response to rain is having a bang-up spring and summer after hardly blooming at all last year. And the orange bulbine just keeps going and going and going like the pink bunny in those old television commercials. The David Austin rose 'Darcy Bussell' is new to my garden this year and I've grown quite fond of its pretty blossoms. The buddleias are putting on a new flush of blooms now. And the 'Texas Star' hibiscus gives me its daily blossom. The crocosmia is beginning to bloom. That's the year-round bloomer 'Big Momma' Turk's cap behind it. Doesn't this resemble a burning bush? The flame acanthus is full of its tiny flame-shaped flowers now. 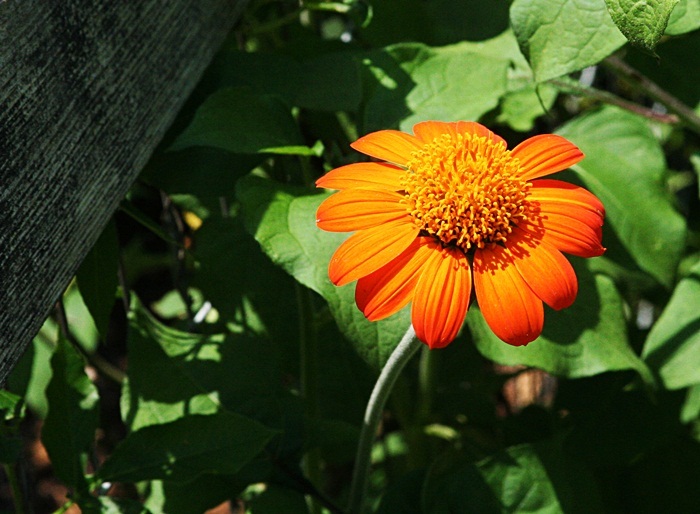 Orange is the dominant color of my garden in summer as exemplified by the Mexican sunflower. And, of course, by the old cannas which bloom all summer long. The Hamelia patens has now joined the bloom parade. Like the bulbine, the yellow cestrum just keeps going and going and going. Now here's a surprise. I was sure that my jatropha was dead and buried and wasn't coming back this year. It took its own sweet time about coming back from the roots after winter, but now it's June and here it is - blooming once again. I hope your summer garden is filled with blooms and that your weeds are tiny and few. Happy belated Bloom Day! This might be more honestly titled "The week in the garden that wasn't" because the truth is I've hardly been in the garden this week. The day that we got home from our week-long road trip, I was laid low by a nasty respiratory infection and it has lingered throughout the week, keeping me mostly indoors. I've only done a few walk-throughs of the garden where the rambunctious weeds shake their leaves and taunt me. "Nah-nah-nah-nah-nah-nah! Can't touch me!" But you see, I'm just allowing my weakened state to lull them into a false sense of security. I shall have my revenge! And soon, I hope. What I have done this week is read. A lot. One of the things that I read was a very interesting article in The New York Times Home and Garden section about African-American heritage gardening. The article was timed to connect with the Juneteenth (June 19) holiday which is celebrated in Texas and in 40 other states. The first sentence of the article, "Enslaved Africans did not win their freedom in order to starve," states the theme of the piece which is about the foods that these freed slaves raised and foraged in order to feed themselves in the desperate years after the Civil War. Many of those foods had their origins, like the freed slaves, in Africa. Reading the article was like reading a history of my own family's gardening. We were not African-American but we were Southerners and Southern gardeners are deeply indebted to Africa and African-Americans for the food crops that we grow. Things like cowpeas, okra, dipper gourds, white cushaws, burr gherkins, and several varieties of pepper were first brought to this country on the slave ships from Africa and they have become staples of gardeners, not only in the South but all over the country. After the Civil War and the emancipation of the slaves, the only way many of those people had of feeding themselves was foraging on the land for things like muscadines, blackberries, and various wild-growing nuts and growing what they could in their own little gardens. Thus, countless African-Americans gardened because they had to and because they could. The same might be said of my people, farmers all, who grew most of what their families ate on those farms. Beyond the African-American crops that we grew, our other main crops were ones that we learned about from Native Americans. Squash, beans, and corn, the famous "Three Sisters" of Native American gardens were staples of ours, too. And, of course, there were members of the nightshade family - potatoes, tomatoes, peppers, eggplants - that were native to the Americas. European immigrants to this country, of course, brought their own garden seeds and tried to grow them here, and some did well. But often those crops were not able to thrive in the soils and climate of this continent. Gardeners are nothing if not practical people and they soon adopted what would work here, even if it at first seemed alien to them. So, today all American gardeners who grow their own foods are benefiting from a long and rich and complicated tradition, one that has roots in Africa and Europe - and, for that matter, Asia, also - as well as the native soil of the continent. The kitchen gardens of this country are an amalgam of what is best from many continents. Just like the people of the country. The flowers of Jerusalem artichoke, another plant used for food by Native Americans and still grown in gardens like mine today. My garden held a happy surprise for me on my return from vacation this week. My 'Ellen Bosanquet' crinums had started blooming in my absence. Some of the clumps were already past their prime by the time I got to see them. But others are just beginning, so I'll still be able to enjoy these blooms for awhile. Normally, 'Ellen' blooming in June would not be a surprise, but I moved all the crinums this past winter, and I rather expected that they might sulk for a year before they gave me any blooms again. It just goes to prove once again you should never sell a crinum short! On the other hand, I had some not so happy surprises in my garden as well. Namely, weeds, weeds, and, yes, more weeds! Some of them knee-high. How can they grow so fast? I've got my work cut out for me for many days to come. Still, it's good to be back in the garden, weeds and all. For the next week, I will be on the road and my blogging will be limited, except for some scheduled posts. The rain that I wished for earlier in the week has come! Late Wednesday we got our first showers, 0.6 inch. Last night we got another 0.3 inch, and now, today, it has been raining steadily for more than an hour, coming down hard at times. We'll definitely get more than an inch of rain this week, making the garden and the gardener very happy indeed. This week, we've enjoyed our first cucumbers and okra from the vegetable garden. One day I made some tasty vegetable soup using produce from our garden, including the okra. Yummy! The cucumbers make a nice and cooling side salad all by themselves or mixed with tomatoes and onions and fresh herbs. I can really make a pig of myself on such a salad. It's a very good thing that the calories in it are so few! Coneflowers say summertime to me. This plant seeded itself in my onion bed - the perennial multiplying onions - and so, of course, I encouraged it to stay. The dried seed heads you see there are from the onions. The 'Mystic Spires' salvia has had plenty of "spires" already this season. Near the spires is a stand of passion vines with their crop of busy Gulf Fritillary caterpillars. The blue plumbago is in one of the driest beds in my garden, one that doesn't often get supplemental water, but so far that hasn't slowed it down. The evergreen wisteria continues to produce plenty of its wine-colored blossoms. And the orange bulbine never quits, no matter what the weather brings. The flame acanthus, the first blooms of which I showed you last week, is in almost full bloom now and that is drawing the butterflies from far and near, like this Giant Swallowtail. The tiny orange blossoms spread an irresistible buffet for the butterflies. The yellow daylilies have been in bloom for many weeks now and continue to send up their flowers each day next to the yellow cestrum and the butterfly weed. The tickseed that I planted this spring in one of the front yard beds presents a bouquet on each stem. While in the backyard, the dinner plate-sized blooms of the white 'Texas Star' hibiscus are opening next to the small pond. As I was sitting on the bench under the magnolia tree this morning, I looked up to see the Giant Swallowtail butterfly that I had been photographing among the flame acanthus resting on a leaf above my head. I couldn't resist just one more shot! I hope your garden has gotten the rain that it needed this week, too, and that all your plants are healthy and happy. If they are, then I know you are happy, too. Karin of Southern Meadows has very kindly nominated Gardening With Nature for the Sunshine Blog Award. What a wonderful surprise! I am very honored. There are obligations that come with the award, one of which includes passing it along to other bloggers who inspire you. I definitely plan to fulfill my obligations, but I need to give that part some thought. I will be posting more on this later, but, in the meantime, I did not want to delay in acknowledging and accepting the award and thanking Karin for thinking of me. So, thank you, Karin! And thank you also for your wonderful blog which is an inspiration to so many of us. It has been two weeks since our last rain and I would not have believed just how fast everything has dried out. We had become spoiled I suppose because we had regular rain over the first three or four months of 2012. Then it began to taper off and now it seems to have stopped altogether. Looking at the ten-day forecast, there does seem to be a chance for rain this week, but I am not hopeful. Well, that's not quite true. I am certainly hoping, I'm just not counting on it. The combination of a lack of rain and temperatures in the mid-90s has really done a number on my garden. Everything looks parched. I spent the day today moving the sprinkler around, trying to provide some moisture to the worst-looking areas. The problem is that the entire half-acre yard is quickly becoming the "worst-looking" area. Running the sprinkler is not good for my water bill, but it certainly makes the birds happy! They flock to the sprinkler's spray to cool off and to take their baths. Every time I go to move it, about twenty or so jays, doves, cardinals, and robins fly up into the trees and wait to see where the spray will appear next. It is so hot out that it's difficult to do much actual work in the garden. Consequently, the weeds are getting the jump on me again. Isn't it amazing that no matter how hot and dry it gets, it never slows the weeds down? The dry weather doesn't seem to be affecting the evergreen wisteria either. It is in full bloom now. Perhaps it thinks it is a weed! Much of this week "in the garden" has actually been spent in the kitchen as I worked to preserve the bounty from the vegetable garden. I baked four dozen zucchini-nut muffins for the freezer for our breakfasts in coming months, canned fifteen quarts of food-processed tomatoes for vegetable soup base next winter, and made ginger-squash pickles from the last of the summer squash harvest. We also harvested our corn and potatoes and had the first of our 'Chinese red noodle' beans for lunch yesterday. All of our lunch yesterday, except for the cornbread sticks, came directly from our garden. Very satisfying. The garden is showing the effects of the mid-90s heat we've had on some days, plus the drying wind and the waning of the regular rainfall that we received over the first three months of the year. In short, things are dry, and, by mid-morning each day, everything looks wilted and sad. Supplemental watering is in order, but I'm trying not to make the plants dependent on that and keeping my fingers crossed for the rains to return. This week in the garden several new blooms made their appearance. The rangy, sprawling shrubs of Anisacanthus wrightii (flame acanthus) began sending out their flame-shaped blossoms. Within the next couple of weeks, the shrubs will be covered in these blooms and the plant will live up to its common name as it appears to be on fire. 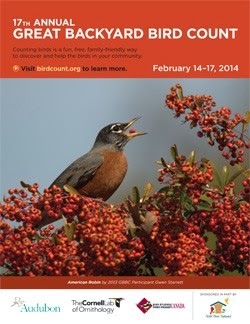 And the butterflies and hummingbirds will be in heaven! The 'Montrose Purple' vitex is full of its eponymous purple blossoms. Back in the veggie garden, the Jerusalem artichokes are sending up these pretty yellow flowers. The Texas sage is full of blooms. It usually blooms in response to rain, so I guess it must be celebrating the rain we got about ten days ago. The bleeding heart clerodendron is finally blooming again. 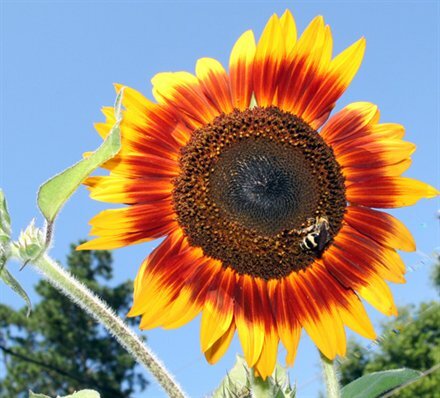 Last year, the plant came back very late after a harsh winter. In fact, I had given up on it. It came back, but it never bloomed. This year, after our mild winter, it came back early and now it is blooming for the first time in two years. Never say die! The red version of the 'Texas Star' hibiscus is in bloom. The white variety has big, fat buds but hasn't opened any of them yet. 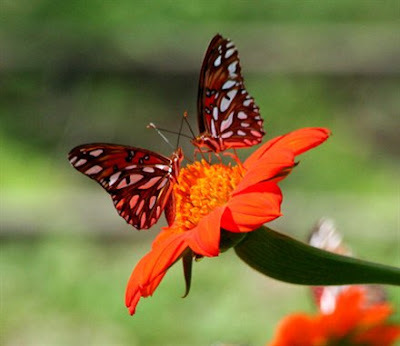 The Mexican sunflowers continue to brighten my world and make my butterflies happy. And the Black Swallowtail caterpillars continue to munch their way through my dill crop. I hope your week in the garden has been a good one.